In a recent speech, Obama mocked the "drill, drill, drill" strategy, and called it a "bumper sticker," not a real solution to high prices at the pump. Well, the drill, drill, drill strategy seems to be having quite an effect on residential natural gas prices, which just fell to an inflation-adjusted ten-year low in December, according to new data from the EIA (see chart above, adjusted for inflation using the CPI). At $9.69 per thousand cubic feet in December, residential customers were paying the lowest inflation-adjusted price since March 2002, almost ten years ago, when the price was $9.09. 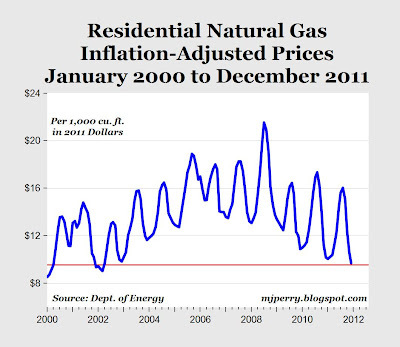 As recently as the summer of 2008, prices peaked above $20, at more than twice the current level. 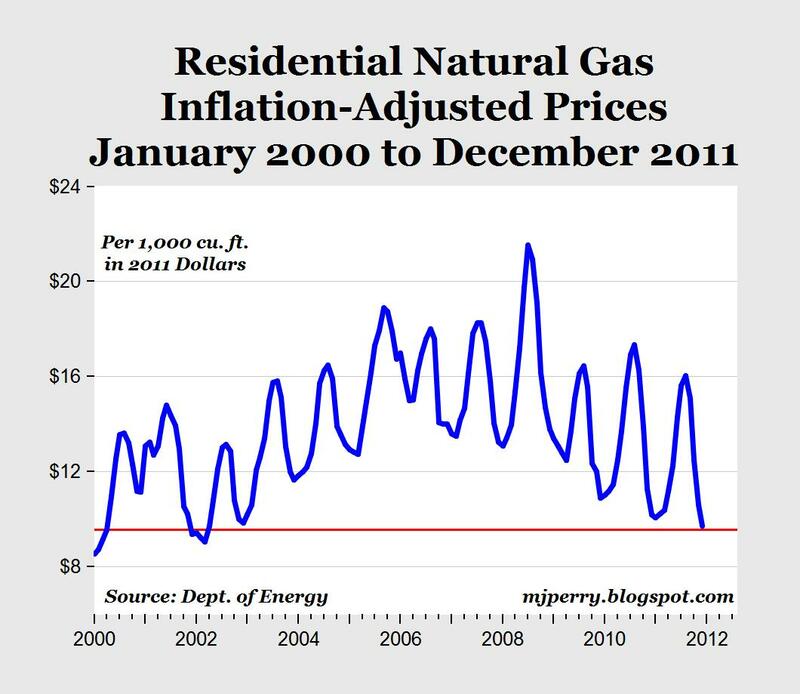 Why are residential gas prices the lowest in a decade? As I pointed out yesterday, natural gas production peaked in December at the highest monthly production level in U.S. history, see chart and post here, and it's the abundance of shale gas being produced at record high levels that is bringing prices down to record low levels. In other words, it's just simple, basic economics of supply and demand. Drill, drill, drill = increased supply, supply, supply = low, low, low prices. I don't doubt that the POTUS is a smart guy, but I'm constantly astounded by his failure to grasp even the most basic economic concepts. Oil and gas production is surging in the United States, rig counts are way up, and corporate profits are setting all time records, both absolutely, and relatively (relative to GDP). The DJIA is up 60 percent from inauguration day 2009 to now. And I think it is rally time for the rest of the year. The DJIA was down 35 percent after eight years of Bush jr. and mostly GOP rule in the House, Senate and Supreme Court. Our biggest banks were bust, and we were stuck in two endless wars. GDP was contracting at a 10 percent rate. I agree with thedirtymac. Obama never talks sensibly about energy or the economy. (Of course, Gingrich promises $2.50 gas). And yet, the option to Obama may be far worse. The GOP track record smells like a skunk in outhouse next to a rendering plant downwind from a manure yard. "Oil and gas production is surging in the United States, rig counts are way up, and corporate profits are setting all time records, both absolutely, and relatively (relative to GDP)." And this has absolutely nothing to do with your boyfriend. Since he began his ruinous reign, Obama has declared 85 percent of our offshore areas off-limits, decreased oil and gas leases in the Rockies by 70 percent, declared an illegal drilling moratorium in the gulf, and cancelled the Keystone XL pipeline. He routinely calls for higher taxes on oil companies, which way do you think gas prices will go if he succeeds? He and his Energy Secretary are both on record calling for higher gas prices. During the 2008 campaign, he openly declared he had a plan to make electricity prices "necessarily skyrocket." He should be celebrating the recent price hikes instead of taking credit for the increased production from an industry he's doing what he can to destroy. "The DJIA is up 60 percent from inauguration day 2009 to now. And I think it is rally time for the rest of the year." And the national debt is up $5 trillion. Food stamps have almost doubled. We have a million more people in poverty. The price of gas is up 100%. So much for Benji's compassion for the poor and middle class. He's pimping for the fat cats! "The DJIA was down 35 percent after eight years of Bush jr. and mostly GOP rule in the House, Senate and Supreme Court. Our biggest banks were bust, and we were stuck in two endless wars. GDP was contracting at a 10 percent rate." And now we're bouncing along the bottom and much much deeper in debt. Hurray! "And yet, the option to Obama may be far worse." I'd go back to Bush's worst deficit of around $400 billion any day of the week. Instead, the Alinskyite will probably finish us off if re-elected. U.S. natural gas output has increased to 22.7 trillion cubic feet (tcf) in October 2011, from 20.2 tcf in December 2007. Nat gas imports have fallen to 1.7 tcf today, from 4 tcf in 2008. U.S. nat gas prices are also cheaper relative to international prices. Then why do you say the POTUS is a smart guy thedirtymac? We have more active Wells now than when Bush was in office. We are now a net exporter of gasoline. So what? This has little to do with who is in office. All I can tell you is my net worth is higher now than when Bush left office. Historically, no matter which party is in power, the economy tanks when an incumbent is not re-elected. If you want a better economy, put aside your mantra, and support the incumbent. Or, you can continue to ignore or rewrite the facts. Starting in April you van order a new Silverado with dual gas and CNG tanks. Probably around $3000 extra will buy you a $6k to $10k savings over three years. With 36 gallons of gas and an 18 gallon (??) CNG tank you can go 650 miles. GM isn't saying how much of that range is CNG. There are about 500 CNG stations open to the public, nationwide.